Carnival has long since enjoyed a reputation as being one of the liveliest lines in the business. And with new additions such as the Alchemy Bar gracing the decks of Australian based Carnival Spirit as well as eight other fleet members, it’s easy to see why it continues to attract hordes of pleasure seekers. Described by Carnival as a “premium” and “interactive” experience, Alchemy Bar represents a new era of at-sea drinking. As the name suggests, the venue is inspired by pseudoscience and brings a notably experimental edge to the concept of at-sea cocktails. A “unique vintage-themed cocktail pharmacy” is the exact phrase Carnival uses to describe its creation. As well as a menu of specially created potions, guests can also use a bespoke prescription pad to select ingredients that take their fancy. They then watch on from their bar stool as their personal mixologist creates their customised concoction. According to Vandekreeke, it’s a combination of premium ingredients, friendly service and dynamic interaction that make the bar such a unique experience. “There’s something magical about sitting down for a drink and being involved in the process of having it personalised just for you, to suit your mood in that moment,” explains Vandekreeke. Unlike other conventional cruise ship bars, Allen says that Alchemy Bar takes at-sea drinking to a whole new level, maintaining that passengers are enticed by “the experience of having a cocktail handcrafted for them using unique ingredients such as lemongrass, orange peel, homemade bitters and even freshly-made syrups like chipotle and pineapple.” The menu features tantalising ‘mood enhancing’ potions, fashioned with the freshest ingredients, top shelf spirits and handmade flourishes. Here are a few of our absolute favourites! THE DEAL CLOSER – Absolut Vanilia Vodka, Disaronno Amaretto, Irish Cream and chocolate liqueur. The best advice this side of Dr. Whoever. SPICY CHIPOTLE PINEAPPLE MARTINI – Prepared with Belvedere Vodka, chipotle pineapple syrup, pineapple juice, simple syrup and mint leaves. THE YOUTHFUL & BOLD BERITINI – Buck the currents of time with Grey Goose Cherry Noir Vodka, St. Germain Elderflower Liqueur, strawberries, fresh lime juice and a splash of soda complete this martini to enliven the throes of youth. FIERY TROPICAL PASSION MARTINI – Feed your fever with this feisty dose of Patrón Silver Tequila, Patrón Citrónge, spicy mango purée and fresh citrus. CARIBBEAN MANHATTAN – Take a breather. Makers Mark Bourbon, Sweet Vermouth, spiced brown sugar syrup and bitters. 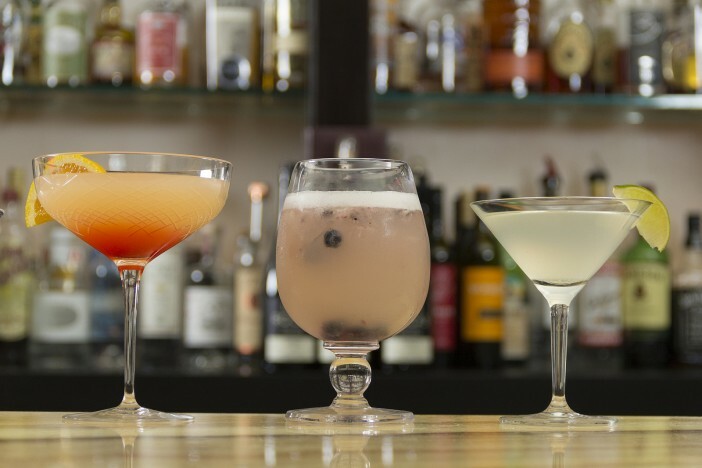 With both cocktails and mocktails on the menu, as well as the opportunity to create your own custom concoctions there’s something for everyone to sip on! With such a galvanising concept comes the need for an electrifying team. Alchemy Bar is fronted by a seriously skilled team of mixologists who have been trained to the highest industry standards. “Our on-board bars have always been great social hubs but Alchemy takes it to the next level with an intimate interaction between guests and bartenders, who have been handpicked from across the fleet to work at the new bar,” explains Allen. Ready to book your alchemy inspired cocktail experience with Carnival Cruises? Cruise 1st is currently mixing up some incredible deals on a huge range of itineraries. Whether you want to sail from Australia on the Carnival Spirit or jet off somewhere further afield, Carnival has you covered. Image sourced via Flickr Creative Commons and Cruisington and Carnival Cruises Media Center. Credit:Didriks, Cruisington, Carnival Cruises.